Over the summer time, PERC sponsored the "Teen Summer Game Days" event. Teens got to play a lot of the games offered at PERC. Tutti Frutti was played on the very first game day and it was a favorite! Tutti Frutti is recommended for older children and their parents. 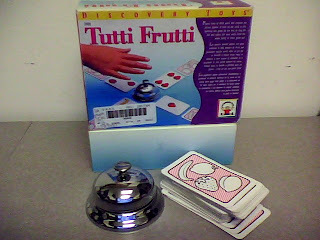 When the cards are flipped over there are fruits on the other side; players must recognize the fruits in the pictures and the amount of fruits to hit the bell. It is a fun and fast game that you and your child(ren) will love!